"Ha -ee Boyay oo-ooo, Ha-ee Boyay oo-ooo" (sing along to Happy Birthday tune), it was very cute and for quite a few years whenever it was someones birthday we would sing it like Stephen did. Then all of a sudden, I don't know why, I started to sing different versions of it to family when I called them on the phone on their birthday. So instead of wishing them "Happy Birthday" I sing the song in whatever style takes my fancy on the day. To date we have had: Operatic style, Rap style, Jazz, Hip Hop, Elvis, Folk. I know that to a lot of people this is a VERY unusual tradition but I am sure that if I didn't do it, my family would be a little disappointed ( or perhaps relieved) I'm not totally sure. What I am sure of is that when I sing down the phone to them I know that they are smiling and enjoying every minute of it, not one person has been grumpy after an Angela "Happy Birthday " song. Click on the You Tube link above to see and hear another great version from Ernie on Sesame Street. You can't beat a great "Happy Birthday" song to put a smile on your face. Last night we were expecting a huge rainstorm, and as the clouds got darker, we saw this brilliant white cloud against the blue/ black sky , reminded me of a puppy at first and then it changed and ended up looking like a rabbit. Very Cool. 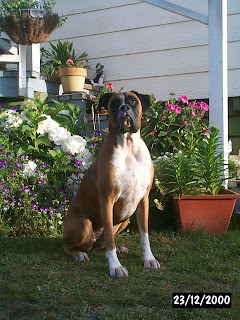 What we can learn from dogs..
"In loving memory of Beau, who was part of our family for 14 years. Passed away 12 November, 2009"
Just have to share this recipe..
with you all. This is a great recipe for those times when you are stuck for ideas (specially if your husband takes his lunch to work), or if you are wanting to do something different for lunch on the weekend or over a holiday break. I can't imagine it appealing to children unless yours like to eat eggs. Don't freak out by the number of eggs that are used, it is very healthy. Full of protein and not empty carbohydrates. Use either a shallow muffin tin that holds 12, or deep muffin tin that holds 6, and spray with cooking oil. Put the frozen veges into a bowl and microwave until cooked (depends on the microwave). Whisk together the eggs, milk and cheese, season with pepper. Once frozen veges are cooked, drain off, and spoon into the muffin tray. Ladle the egg mixture evenly into the muffin tin. Place in the oven and bake for 15-20 minutes, or until golden and the egg has set. Serve hot or cold, with some yummy chutney or relish. Note, than when the frittatas go cold they tend to shrink quite a bit, but are still yummy! Hope that you have a go and enjoy! There is an old NZ saying that goes "When there's an egg in the house, there's a meal in the house". Just as a side-note, our eggs were farm fresh, from free-range happy chickens supplied by my work colleague Kim. Which is why they look so yellow. I decided to take the camera with us when we went for our walk this morning, this empty field is not far from our house and I took the photo through the wire fence. I am very much an amateur when it comes to photography, and have really been playing around with the camera, but I think this is not too bad an effort. There is just a hint of shadows coming from the plants and the trees on the left. What is it that makes up my character, and what have been the major influences in my life to mould me into the person that I am. Should I ask friends and family to give me their thoughts? Do I really care what they think, after all I am who I am when all is said and done? From an early age I did not have my mother in my life and was brought up by my father and extended family members. This taught me the importance of family and what it is like being part of a loving extended one consisting of many Aunts, Uncles, Cousins and of course, family friends. All of these people are very important to me, and these influences became key factors in my makeup. While at school I discovered sport, in particular athletics and netball. I loved athletics and was involved competitively until I was 17. I continued running for years, taking part in half marathons and fun runs. Running helped me to get through the stresses of being a working mum, and bringing up three children. Netball was also a great love and I played netball until I was 27. Net ball and athletics developed in me the ability to listen to coaches, be a team player, and have the ability to stay focused. So here I am today a great listener, team player and able to focus when necessary. When my children were young we spent 18months living on Mototapu Island. Access was only by ferry from Auckland City. No electricity, only generator power for a few hours each day, shopping done once a week. The time spent on the island tested this city girl beyond my wildest dreams. I learnt how to be totally self-sufficient. I made my own bread (no bread-maker in those days), had my own vegetable garden, and like a true pioneer woman would go everyday thru winter to collect firewood and pine cones to keep the fire going. Too bad if the groceries ran out, we would just have to make do with what we had. This made me pretty self-sufficient and I have been known to rustle up a meal from nothing. This has made me the type of person who only sees solutions. I believe that our character develops and grows as we get older. Bring it on. This photo was taken from our front verandah, at aprox 8.30pm. I love the dark shadows of the telegraph poles and the hills, against the pink/red of the clouds and the palest blue of the sky, with the hint of yellow from the sun as it descends. It was a great end to a glorious summers day. Following on from my post last night this is one of my favourite photos of all time. It epitomises those colour 'likes' that I posted about earlier. This is a photo of my mother-in-law, Joy Dunn aka: Nan to me and the grandchildren and Jo Jo to the great-grandchildren in the USA. Taken in February 2009, at the height of our summer. We were all sitting in the back garden watching Emma and Lucca playing in the paddling pool. I love the colours in the photo, the bright colours of the umbrella together with Nan's top, and the flowers in the background. Nan took every opportunity that she could to be part of the 'goings on' with Emma and Lucca while they were here. Not only is the photo rich in colour, Nan's beauty and love of life shines through. There are so many photos of young families, babies and children on the Blogs that I have seen, why not take some time out and post some photos of our wonderful 'Seniors' who add such richness and colour to our lives. Hmmm Likes and dislikes. I guess I could write a list with the obvious things but after much pondering and navel gazing I have come to the conclusion that what I like is colour: the colour of nature, the colour of people, the colour of everyday life. As unusual as it may sound it is the one thing that I am most aware of. From a young age I always looked at things from a colour perspective. In art class I was hopeless at drawing anything but when it came to putting colours together I loved it and took my cue from Nature. While writing this we have a balmy NZ summer sunset happening, all pink and yellow with white clouds starting to turn grey with a promise of rain. Beautiful, ask me to paint it and all I would see are the colours, how the colours all work together. Colour of people - not their skin colour but their personality. I am a great people watcher, and love to see the interaction of people with each other. Today I watched a group of teenagers, together in the holidays, all full of the joys of life enjoying each others company without a care in the world. Yesterday it was a grandmother shopping with her grandchildren, seeing how excited the children were to be with Grandma. The colour of everyday life - Everyday is different and brings with it a myriad of challenges. The frustration, happiness, sadness and joy that we get from our surroundings and the people around us makes up the colour of everyday life. Whatever it is that "floats your boat", no matter what, make it as colourful and as memorable as you can. In a cupboard in our house I have a storage box that on inspection holds an abundance of memories dating back to when my children were very young. A few days ago I hauled the box out and went through the bundles of cards that I have been keeping. It has been a few years since I spent time going through my collection. I have just been putting them in the box and closing the lid. Like photos, each one of the cards holds memories of events and people that I have known and with some have lost contact with as well as people who are no longer with us. 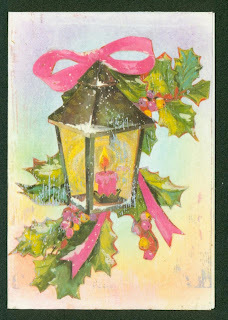 There are birthday cards, engagement cards, wedding cards and Christmas cards. Some cards are hilarious, some are cute, some home-made. The one thing that they all have in common is that they have all been given with love. I don't think that I can ever bring myself to get rid of them, and hope that when I am old and waiting at the "departure gate" my family will go through them and they will bring back a flood of memories for them as well. These images are two of the oldest I have. 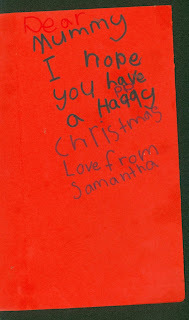 The red Christmas tree card (above) is a handmade card from Samantha my youngest daughter. At a guess I would say she was probably 6-7 years old when this was made, note the big sister correction on the word "happy". Sam is now 30. 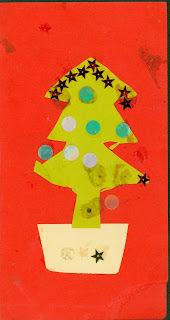 The other card (below) is also handmade, and was made by Nana Olding, the children's paternal grandmother. She made all her cards, and called them all by the name of "Posey Moments". This one is dated 1995. Have had a big think about this, and my first thought was to write about my wonderful husband, Phil, and then I had a real think and thought that perhaps I should put down the people who have been my biggest strength in the past, that are always available to me in the present and should I need them, I know that they will always be there for me in the future. Linda: ( big sister) That's her on the far right in the photo. • Ultimate knitter and now owner of her own yarn shop (Threads and More in Brisbane). Stephanie: (little sister) That's her on the left in the photo. Ivan (my Bro') He has a photo of his own as we all know that Ivan is never in family photos. Here they are - my official support unit. 1) The highlight would have to be "hands down" the arrival from the U.S in February, of Evette (no 1 daughter for those who don't know) and the only grandchildren I have, Emma (3 - below with Mummy) and Lucca (9mths - right with Poppa) for a six week holiday "Down Under in NZ". Unfortunately Jared (husband and father of 'grandies' couldn't join us.) But we pushed on anyway and had a blast. These are only a few of the hundred of photos that were taken. Lots of hugs, cuddles, laughs, tears, tantrums, and all the wonderful stuff that goes on when you have little ones around, not to mention total exhaustion. It's difficult to put into words how I felt just having them here for that short time . 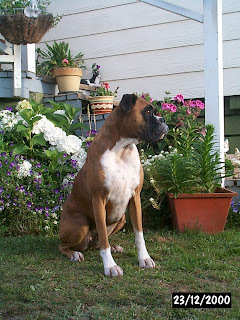 2) The low point of the year and the saddest time for the whole family was that after 14 years with us, our much loved, handsome, Boxer Beau passed away on the 12 November. Our house is very quiet without him around, not only because of his personality, but there is now no more snoring to keep us awake at night. 3) I have decided that my third thing for '09 would be to Blog about the best purchase I made over the year. Yes, I know what you're all thinking who the heck wants to know about what I bought, but this is the greatest thing I have come across in a long time. It is a little egg poacher that sits in the pot and makes the best shaped, true to what they should look like p oached eggs ever. Come on, you have to admit it looks pretty darn different and it works. I challenge you to tell me of a better purchase you have made in the past 12 months that does not include cars, phones, cameras, TV's, boats etc, you know what I mean. Something very unique and different. Come on you can do it! Happy New Year, welcome to 2010! At long last, here it is, my Blog. After spending the last few years reading my daughter's and their friends Blogs I have decided that it may be something that I would enjoy doing. 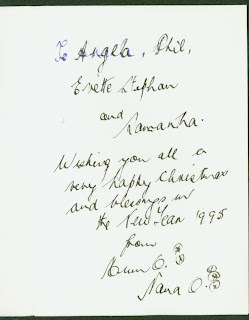 After all we have a pretty busy and interesting life here in little 'ol Waiuku, and I am sure that I must have things to share with people, and perhaps something that would be of interest. the people that we are, and make our family close and strong. How wonderful to be able to share these moments with others of the same ilk. So to start off with here are some photos, taken at our 2009 Pre-Christmas Dinner. Twelve of us got together for a fantastic night of fun, laughter, good food and wine at Gee Gee's restaurant in Auckland, a favourite of us all, the owner Ivan is a friend of our family, and whenever we can, we gather there to be totally spoilt knowing that the food is to "die" for. In true Croatian style, Ivan always makes sure that no-one leaves without a big smile on their faces, and a full stomach. Thanks to all the family who made it once again a memorable night. That's it for my first blog of 2010!